After stalking the weather channel the last few days (a favorite childhood past time) and realizing that 99% of the country is experiencing sub-zero temperatures as we speak, I made an executive decision and decided to declare this week…SOUP week! For the next four days, I’ll be posting a brand new soup recipe each day on the blog. 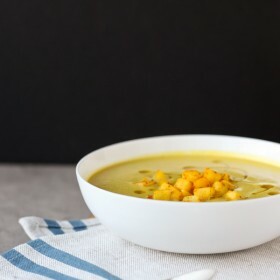 Each soup will be very different than the last, but they are all equally as delicious–not to mention, each recipe can be made in less than an hour. First things first. 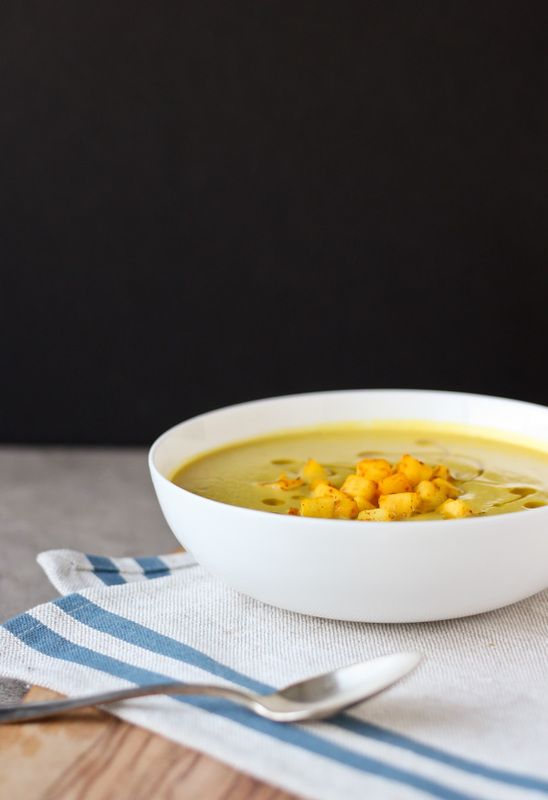 This curried cream of cauliflower and apple soup sounds really weird. I totally get it. When I first came across this idea, I was a little freaked out. Granted, those are also the types of recipes that tend to appeal to me the most. 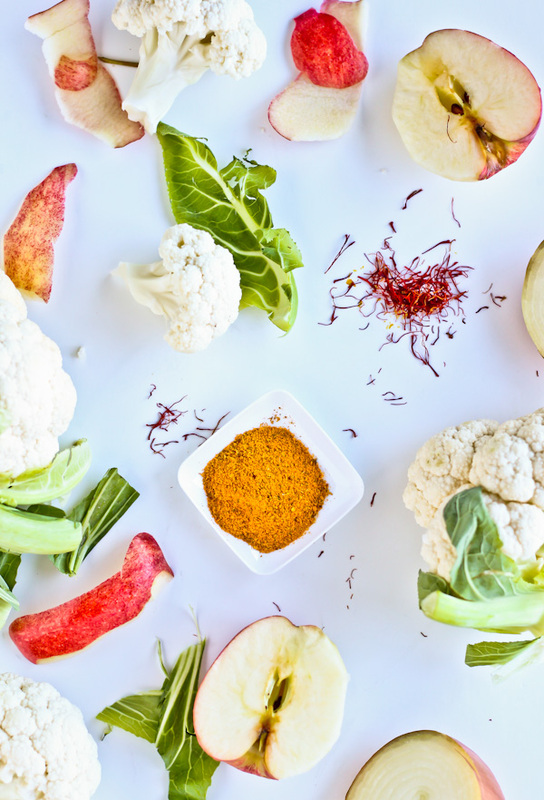 There’s a lot going on…I mean, the combination of cauliflower and apple is not something we see all that often. Cauliflower and curry…yes. Apple? Not so much. Add saffron and a curried, diced apple garnish and it pretty much sounds like a five-year-old’s kitchen experiment gone wrong. Then again, today’s recipe is also an adaptation of a Daniel Boulud recipe. So hopefully that gives you some faith. This soup comes together very quickly. Onions are sauteed until translucent, along with curry powder, ginger, and saffron. 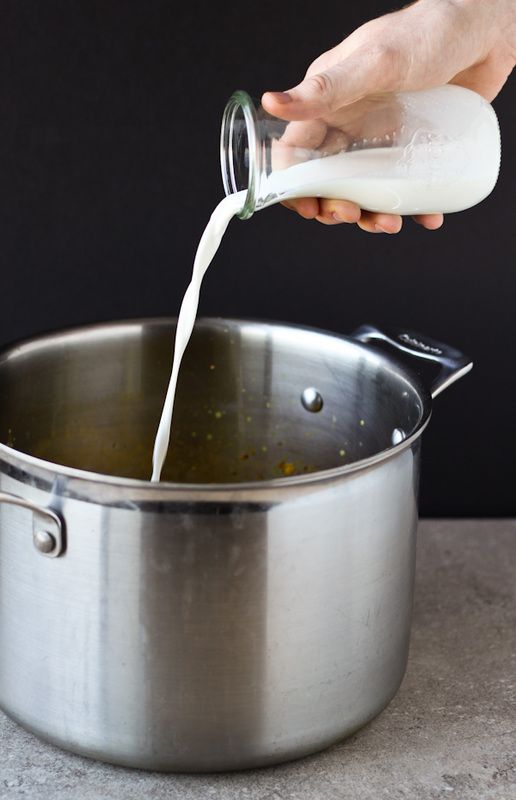 Then you simply add chopped apple, cauliflower, and chicken broth–and simmer everything together for 15-20 minutes, until the cauliflower is fork tender. Then it’s time to puree it all in the blender until it is silky smooth. The original recipe called for one cup of heavy cream, but I decided to take matters into my own hands and lighten it up a bit by eliminating the heavy cream–and substituting this with half a cup of half and half. I do not recommend skipping this ingredient! This resulting soup is silky smooth, creamy, and perfectly balanced. Although the apple is almost indistinguishable in flavor, it does add a subtle sweetness, which helps cut the heat of the curry powder perfectly. The saffron also lends a certain element of warmth to the dish–as it is prone to do–and pulls everything together. Weird? Maybe. But definitely meant to be! Heat the butter over medium heat in a large soup pot. Add the onions, curry powder, ginger, and saffron and cook, stirring frequently, until soft and translucent, about 5 minutes. Add the chopped apple and cook for an additional 3-5 minutes, until soft. Add the cauliflower and chicken broth and bring to a boil. Reduce heat and simmer for an additional 15-20 minutes, or until the cauliflower is fork tender. Stir in the the half and half and continue to simmer over low heat for an additional 5 minutes. Working in batches, transfer the soup to a blender and puree until smooth. Return pureed soup to pot and return to heat. Add cayenne pepper and season with salt and pepper. Keep over low heat while preparing the apple garnish (see below). Add apple dice and one tablespoon of water to a small saucepan over medium heat. Add the saffron and curry powder, mix with a spoon, cover with a lid, and allow to cook for another 2-3 minutes until slightly soft. Season with salt. 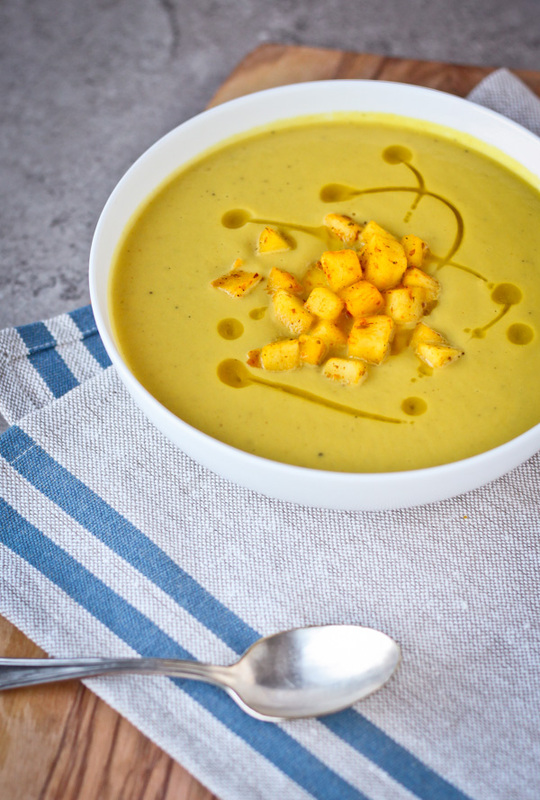 Serve soup piping hot with a spoonful of apple garnish and drizzle of olive oil.